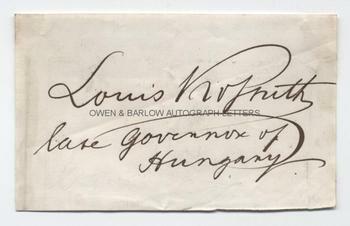 LOUIS (LAJOS) KOSSUTH Autograph Signature. Hungarian revolutionary politician and the first President of independent Hungary. Autograph signature on paper piece with the words added, in his hand, "Late Governor of Hungary". A fine, large signature. This has been purposely written on paper for an autograph collector and is not a signature that has been clipped from a letter or document. Paper piece measures approx 4.5 x 2.75 inches. There are mounting traces to the edges of the blank verso, else fine. Louis Kossuth (or Lajos Kossuth in Hungarian form) was a revolutionary freedom fighter during the Hungarian Revolution of 1848. He had been imprisoned but upon his release he had continued to campaign for Hungary's political independence from the Hapsburg Austria-Hungary. Following the revolution of 1848 he briefly held power as the Regent-President of Hungary. However, after Austria had regained control of Hungary (with the aid of the Russians) Kossuth fled across the Ottoman border and the Ottoman authorities, supported by the British, refused to hand him over. With a price on his head, Kossuth went into hiding before he was finally permitted political asylum in the United States. In America, as elsewhere in Europe, Kossuth was viewed as a freedom fighter and a bellwether of democracy in Europe. Kossuth spent 3 weeks in England en route to America in October 1851, where crowds of up to 100,000 people turned out to see him. He was generally feted as a popular hero by English radicals and it is likely that this was when the autograph was obtained.